Observation - Red Leafed Seaweed - UK and Ireland. Description: Red seaweed with broad, crumpled flat leaves with rounded edges. Slushy texture. Part of large deposit of red seaweeds on beach. 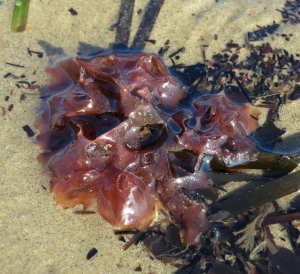 Red seaweed with broad, crumpled flat leaves with rounded edges. Slushy texture. Part of large deposit of red seaweeds on beach.